My under eye area is the first place I notice dryness as the weather cools in the fall. Osmosis Colour Age Defying Concealer not only addresses coverage under the eyes, but also hydration and the softening of fine lines. This dual ended concealer comes with a moisture stick at one end and creamy, pigmented concealer on the other. It's the perfect start to your fall beauty routine. My beauty regimen always starts with a clean face and moisturizer. Our face and under eye area have different needs, which is why I love the rich moisture stick to target areas that need a bit more attention. It contains nourishing ingredients such as argan oil, coconut oil, shea butter, and vitamin E. Not only does this stick hydrate under the eyes, but you can also use it in other areas such as around the lips. The concealer in this duo has amazing coverage. I have the shade silk and it is the perfect tone to conceal any imperfection, but also combat under eye circles. 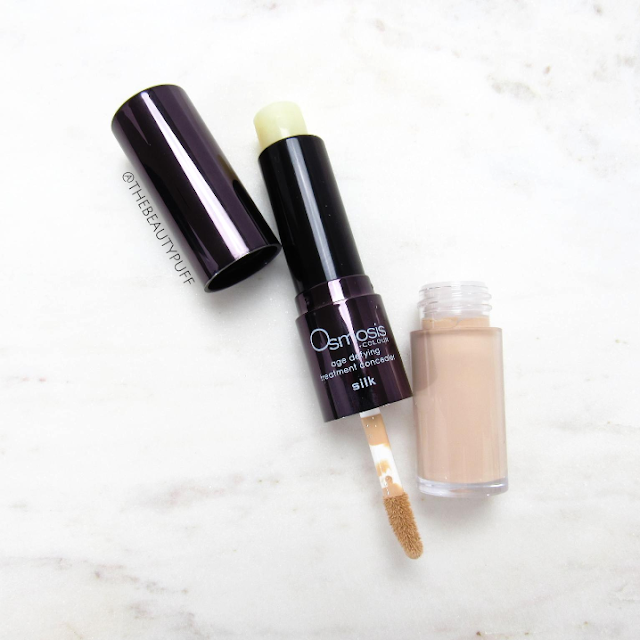 I don't always want to travel with two concealers so this one is a great multi-tasker! The formula is smooth, but not greasy, and blends in effortlessly without setting too quickly. It has a natural finish that looks great even if it's the only liquid product I apply on a particular day. When I'm just running a couple errands or need quick coverage, I apply this concealer, set with loose powder and that's pretty much it! Sometimes I just apply the balm if it's a no makeup day and I need a little extra hydration. Overall, this multi-tasker is a definite must-have for fall and winter! You can find the Osmosis Age Defying Concealer below.